Observers set up their gear in anticipation of a total solar eclipse over Australia on Nov. 13, 2012. Because of time zone differences, it was still Tuesday afternoon (Nov. 13) in the United States during the celestial event. The totality phase of the eclipse — the point at which the moon completely blocks the sun — began at 3:35 p.m. EST (2035 GMT) over the Arnhem Land region in Australia's Northern Territory. Solar eclipses occur when the moon lines up with the sun in the sky, blotting out the solar disk from a viewer's perspective on Earth. There are three main categories: total, partial and annular (in which the outer edge of the sun shines like a ring around the moon in the sky). The last total solar eclipse as viewed from Earth took place in July 2010, and the next one won't occur until March 2015. From start to finish, the "total" phase of the solar eclipse lasted about three hours. At Cairns on the northeast Queensland coast, enthusiastic observers saw the moon cover the sun's disk completely for two minutes, beginning at 3:39 p.m. EST (2039 GMT). 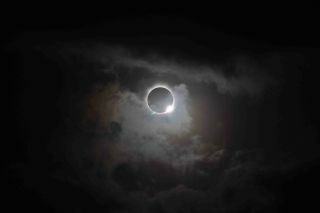 The sun approaches total eclipse in Australia on Nov. 13, 2012 (EST). Several U.S science teams and eclipse webcast efforts made the journey to Australia to capture the event. American astronomer Bob Berman, who watched the eclipse from Port Douglas, Australia, for a webcast by the U.S.-based Slooh Space Camera website, said witnessing a total solar eclipse in person was a "life-changing experience." Observers at his site waited nervously as clouds threatened to obscure the sun during the eclipse, but the skies ultimately cleared in time for some amazing views of the moon in front of the sun. NASA spokesman Josh Byerly told SPACE.com that there was a tiny window in which the moon's shadow on Earth might be visible from the International Space Station today, but the outpost's six-person crew was scheduled to be sleeping at that time. Several groups in addition to the Slooh Space Camera provided live webcast views of the solar eclipse for stargazers unable to make the trip to Australia. They included regional tourism agency Tourism Tropical North Queensland, a University of North Dakota research team and Panasonic. The total eclipse came to an end at 6:48 p.m. EST (2348 GMT) today, with the moon's shadow petering out 610 miles (980 kilometers) west-northwest of Santiago, Chile — about 9,000 miles (14,500 kilometers) from its starting point Down Under. While the next total solar eclipse won't occur until 2015, a so-called "hybrid" eclipse — which shifts between total and annular at different points on the globe — will come to parts of the Atlantic and central Africa in November 2013. Today's eclipse wasn't just a boon for amateur sun observers. Scientists regard eclipses as rare opportunities to study the sun's thin outer atmosphere while the solar disk is obscured. Amateurs and professionals alike probably had an unforgettable experience today, experts say. The eclipse isn't the only celestial treat for stargazers in November. The annual Leonid meteor shower will peak just after midnight on Saturday (Nov. 17), and then flare up again on Tuesday (Nov. 20). On Nov. 28, the moon will star in its own sky show during a penumbral lunar eclipse. A penumbral lunar eclipse occurs when the moon passes on the opposite side of Earth from the sun, but only goes through the outer region of the planet's shadow. Editor's note: If you snapped an amazing photo of today's total solar eclipse from Australia — or any other night sky object — that you'd like to share for a possible story or image gallery, send images, comments and location information to managing editor Tariq Malik at tmalik@space.com. This story was updated at 6:48 p.m. EST to mark the end of the 2012 total solar eclipse.